A company undergoes screening processes on applications and proposals in order to get the best application or proposal that would fit the standards and the needs of the company. 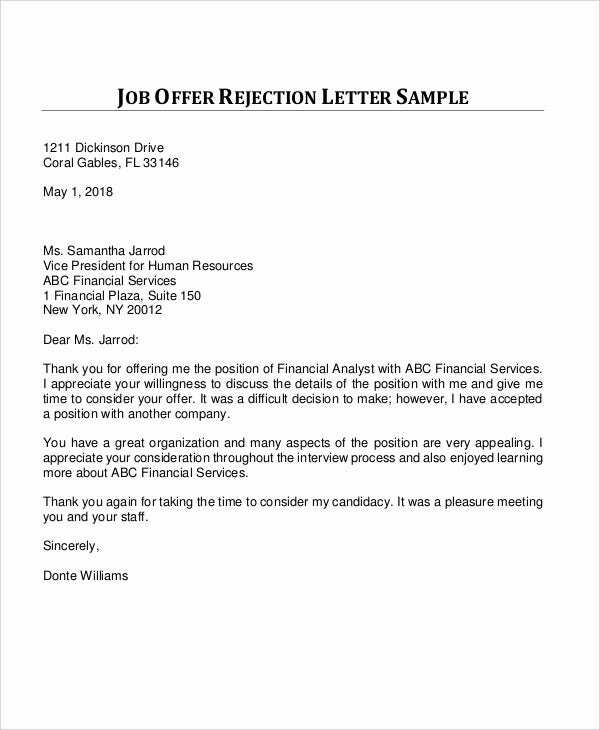 In this regard, a job rejection letter is an essential instrument to inform the applicant of the decline in a formal way. Declining job offer is a result of the screening stage in recruitment processes. 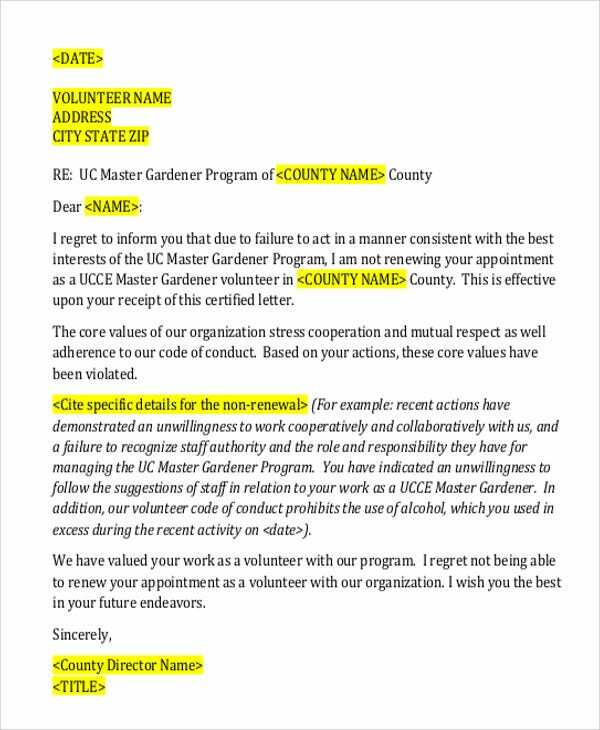 Unsuccessful applicants and proposals that undergo similar aforementioned processes must be professionally informed and a rejection letter does that job. 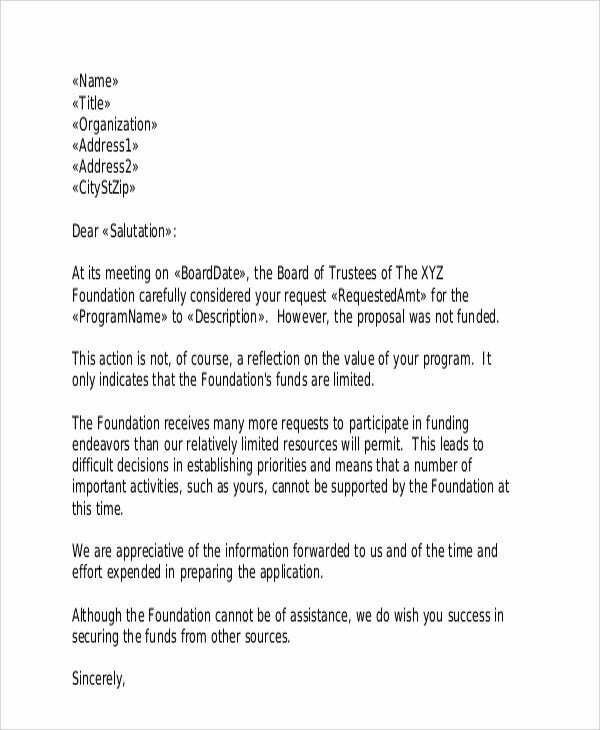 These rejection letters in PDF formats are available for you to use and to download. 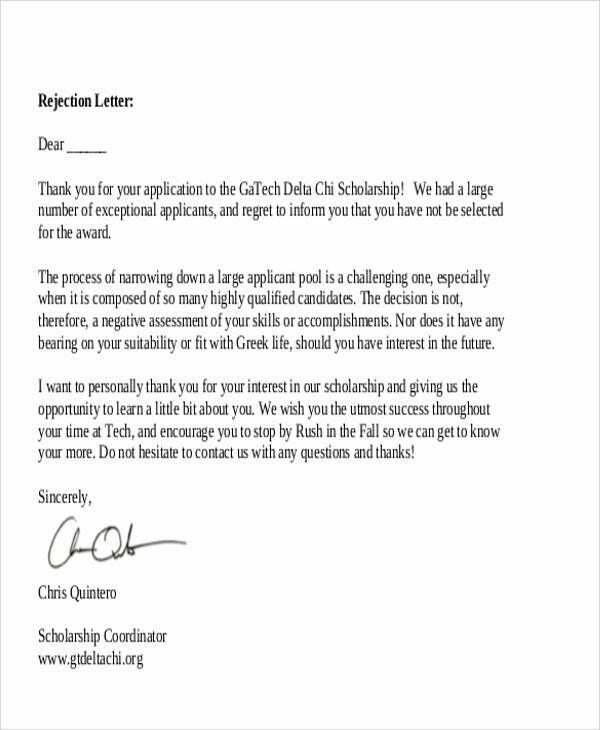 A rejection letter is a letter addressing an individual or a business that an application or a written document has been declined by the receiving entity. 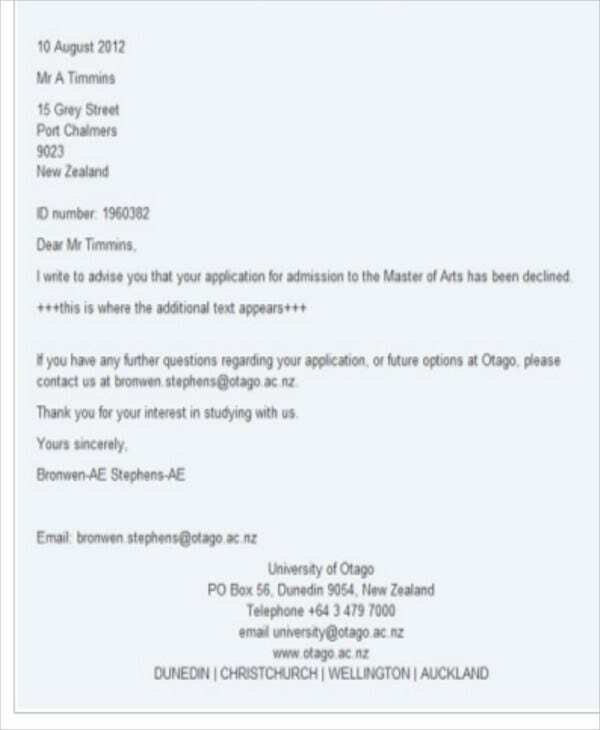 This letter applies to academic and business applications. 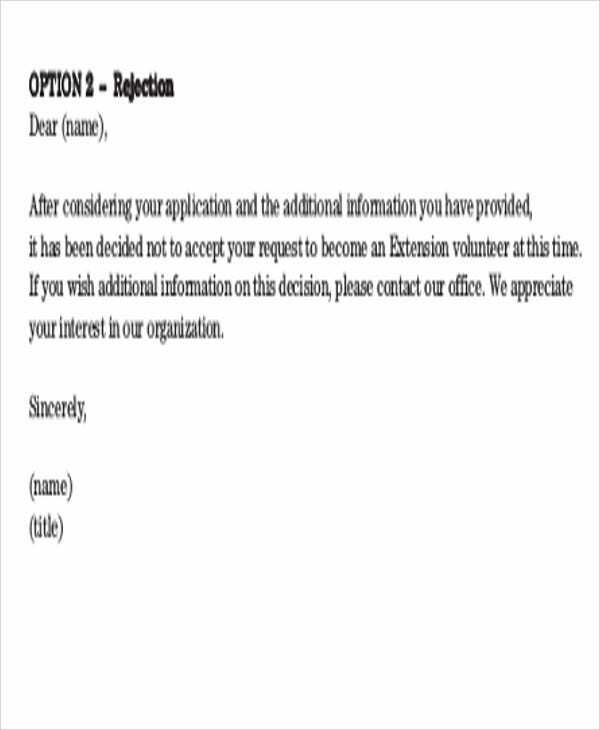 Rejection letter templates provide the formats of rejection letters being used by various institutions. 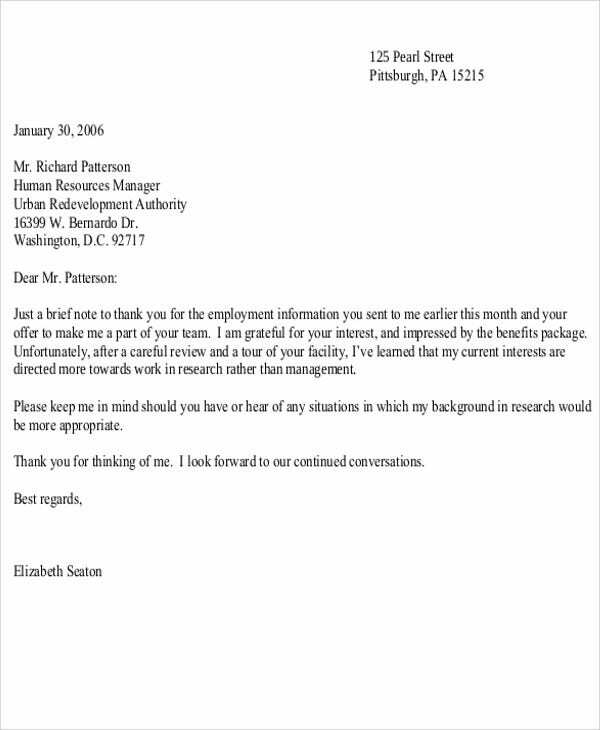 There are instances where an individual gives the rejection letter the company he has applied to. 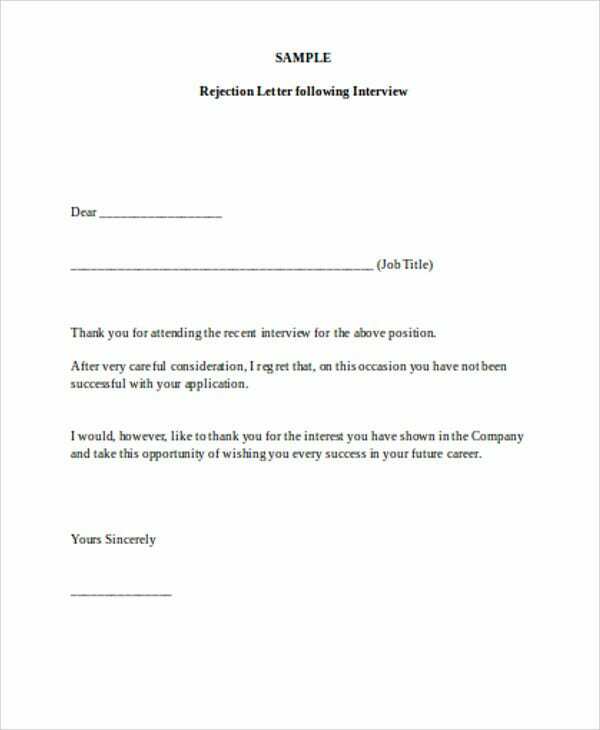 Examples on this form of rejection letter are shown on the offer rejection letter templates which applies to job applicants of a company. 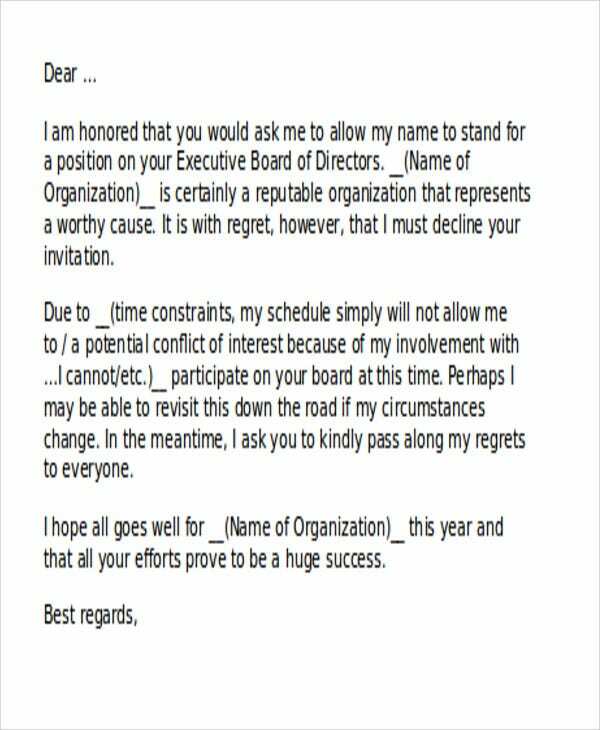 To be professional in executing the rejection. 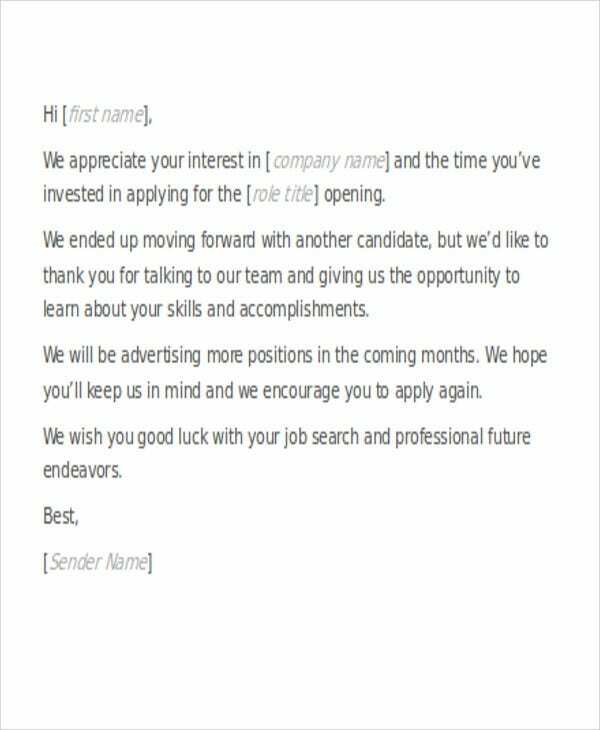 Mailing a rejection letter to the unsuccessful candidate is a professional action for a company to do. To help ease the declined applicant from distress. 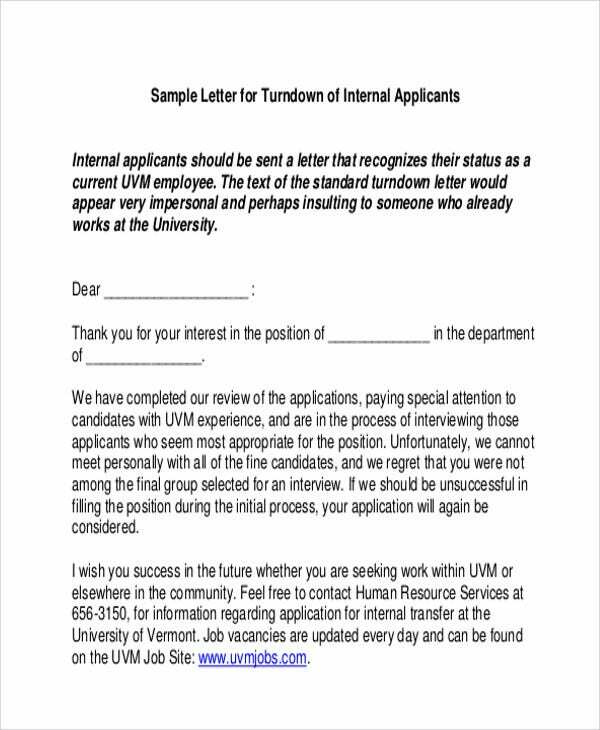 A rejection letter sample shows how a rejection letter exhibits a positive tone in informing the candidate of the decline. 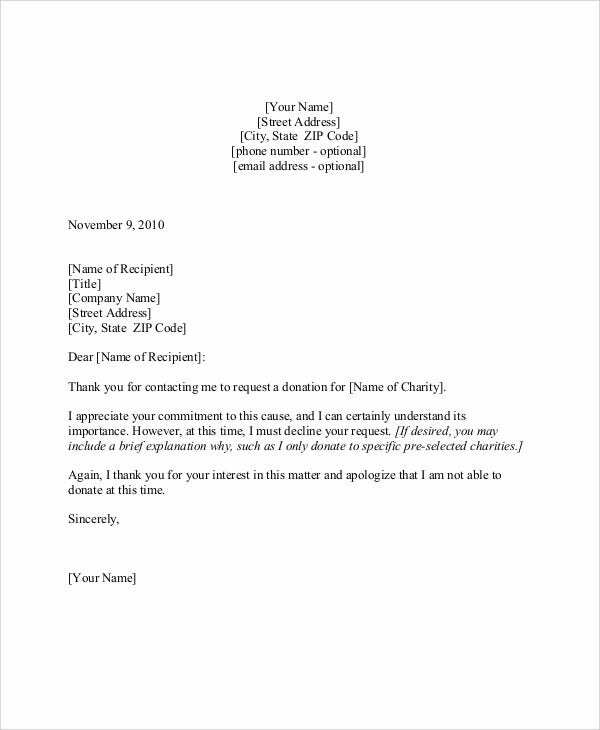 To cease the application in good terms. 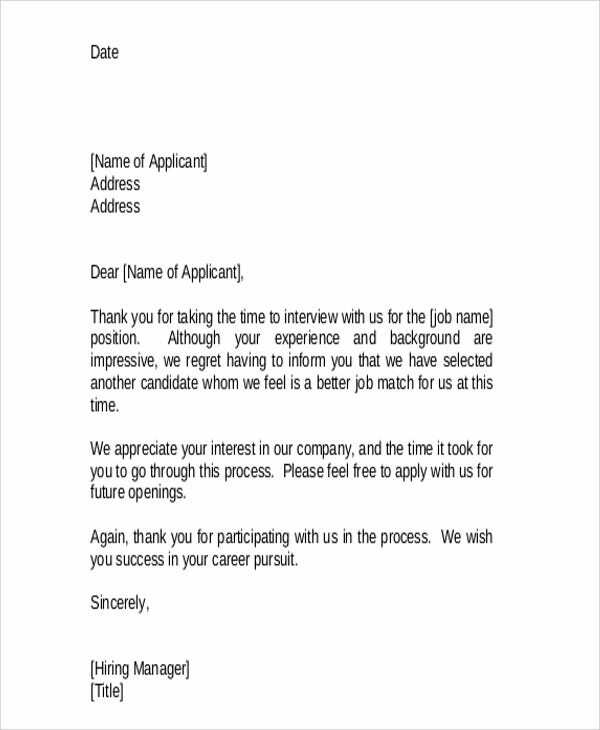 A rejection letter is addressed to the candidate personally which will represent the sincerity of the company to end the application in good terms. 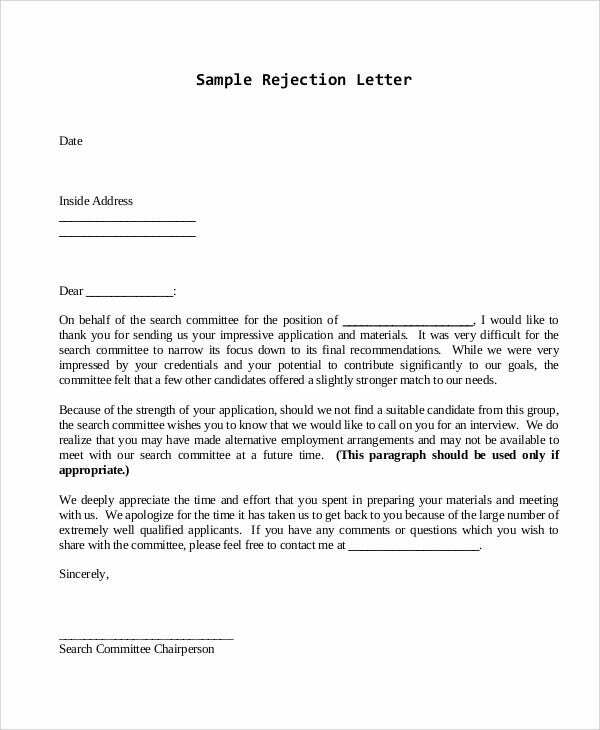 The following information are provided for your perusal to aid you in browsing through the best rejection letter templates on this website. 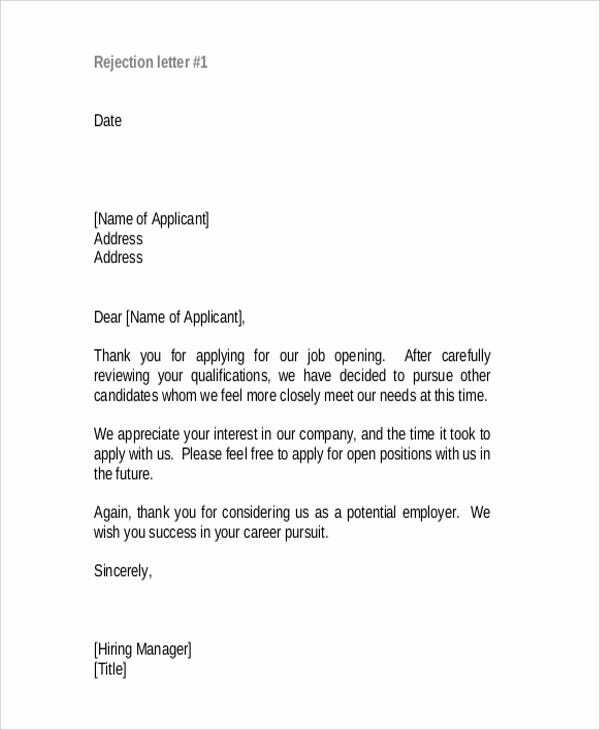 Job Application Rejection Letter – This template presents the format of a rejection letter intended to inform unsuccessful job applicants at the start of the screening process. 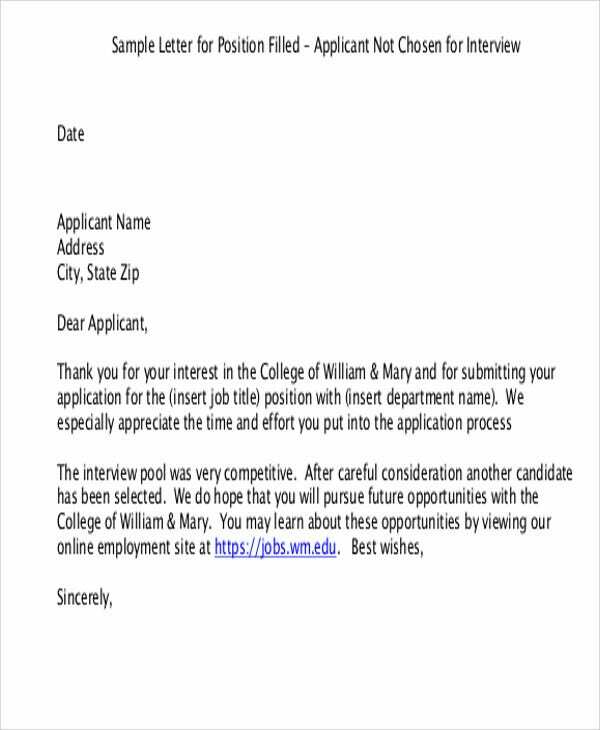 College Rejection Letter – Undergraduate and post graduate studies in big universities usually hold applications in availing for a slot in the school’s program and declined applicants are presented a rejection letter with the sample content on this template type. 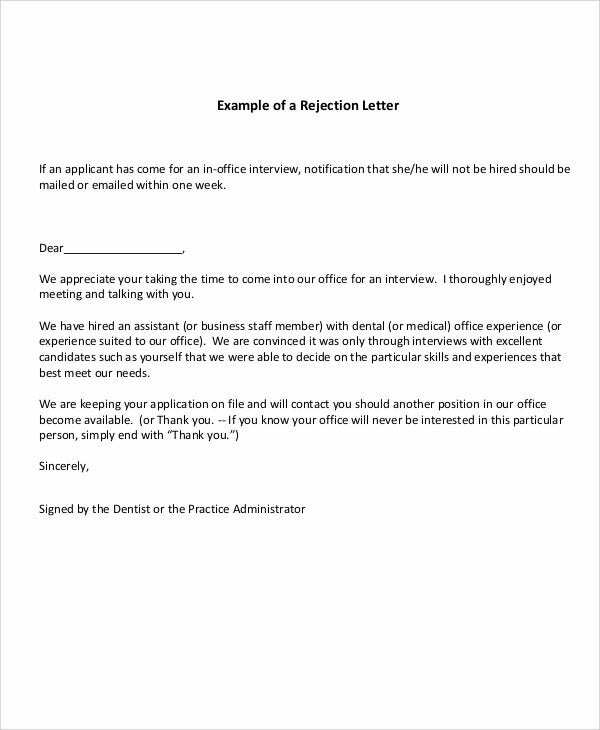 Interview Rejection Letter – The applicant presented with this type of rejection letter template has undergone and failed the interview stage of the recruitment process. 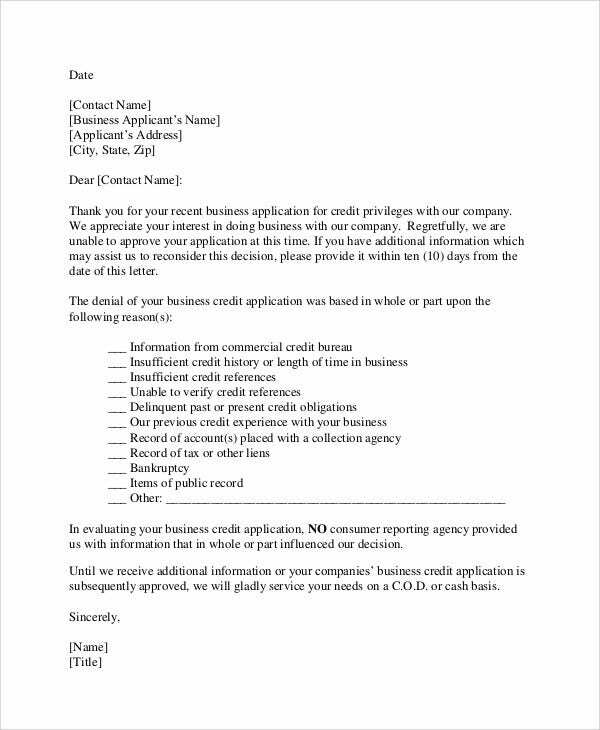 Business Rejection Letter – Rejection letter of this template type is utilized by lending institutions and service provider businesses. 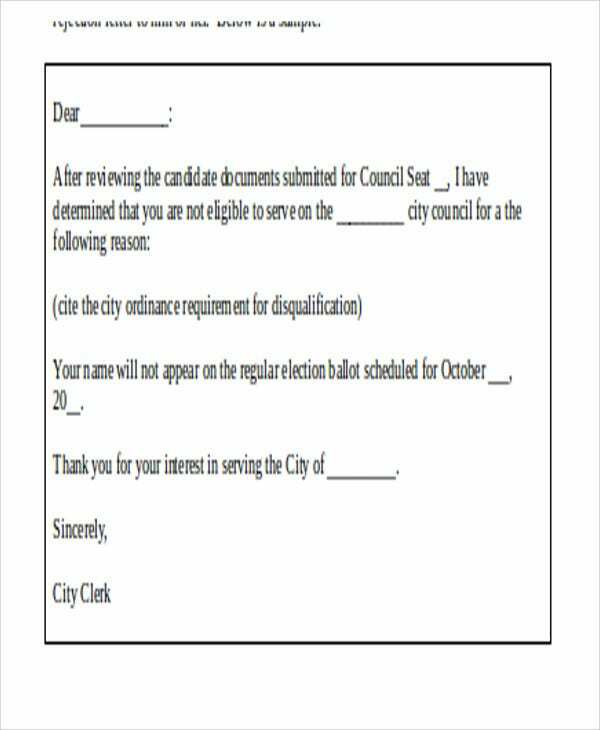 Candidate Rejection Letter – This may be applied to electoral candidate applications who run for a position for a government official position. 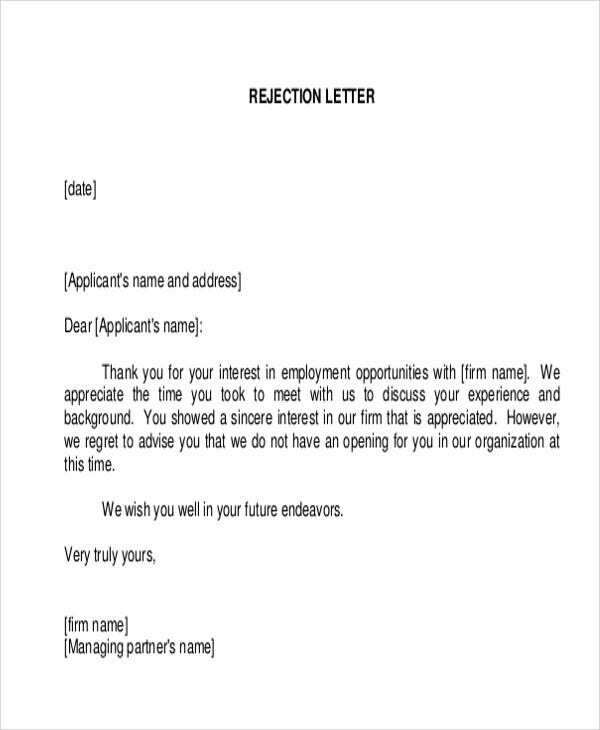 Employee Rejection Letter – There are instances where a company conducts internal application processes for a vacancy and this template type is given to the employees who applied and were rejected. 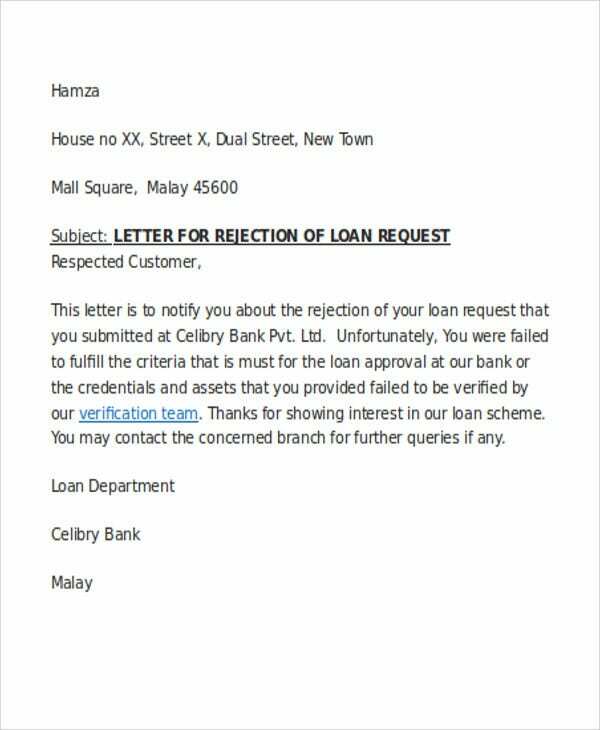 Loan Rejection Letter – Entities are given this rejection letter template to inform them that the loan could not be granted due to the stated reasons on the rejection letter. 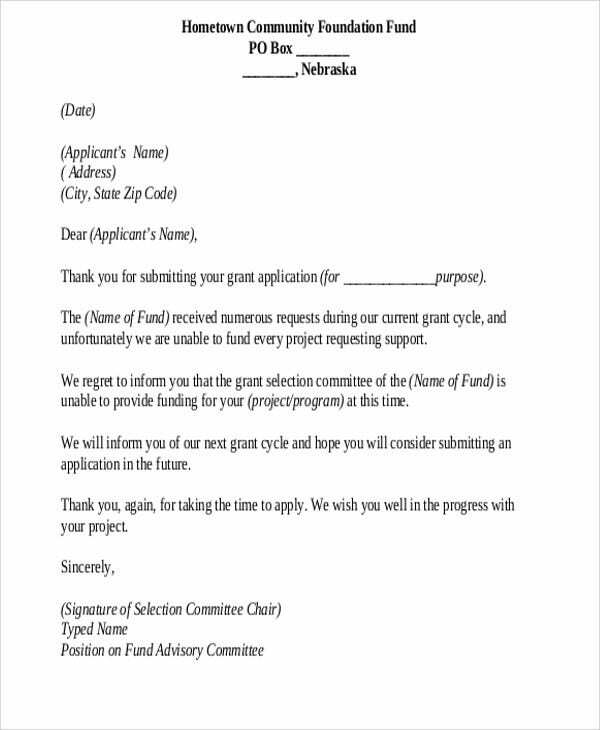 Proposal Rejection Letter – A buyer will disapprove a proposal in the form of a rejection letter with information provided on this rejection letter template. 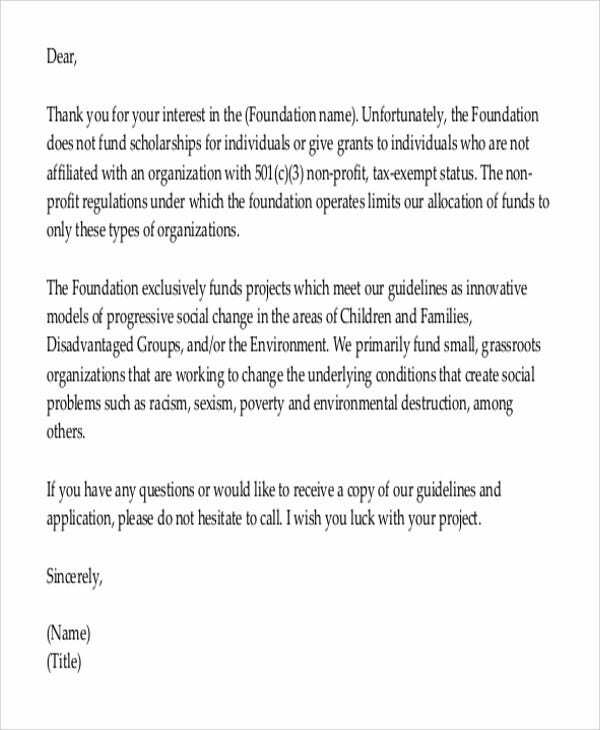 Volunteer Rejection Letter – Volunteer programs especially for public purposes have certain standards in the qualifications of their volunteers which entails the use of this rejection letter template. 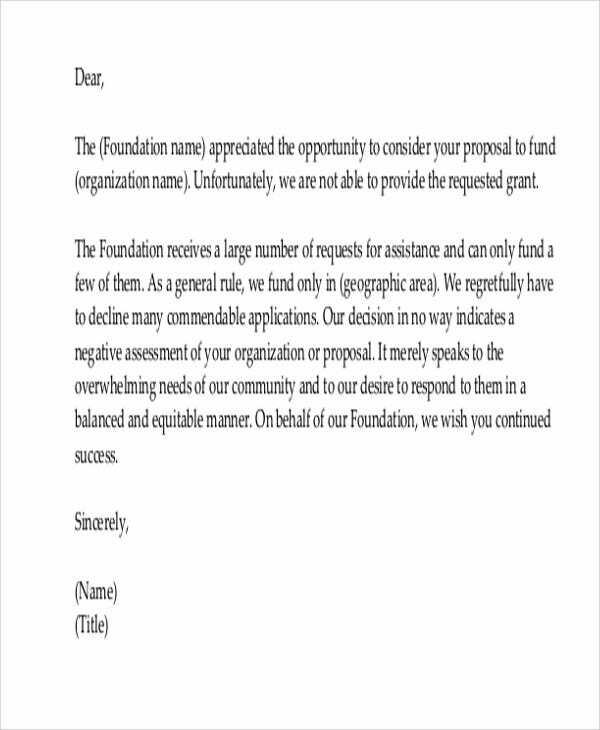 Donation Rejection Letter – Donation, funding and grants may not be awarded to the requesting company or organization for reasons to be specified on this type of rejection letter template. 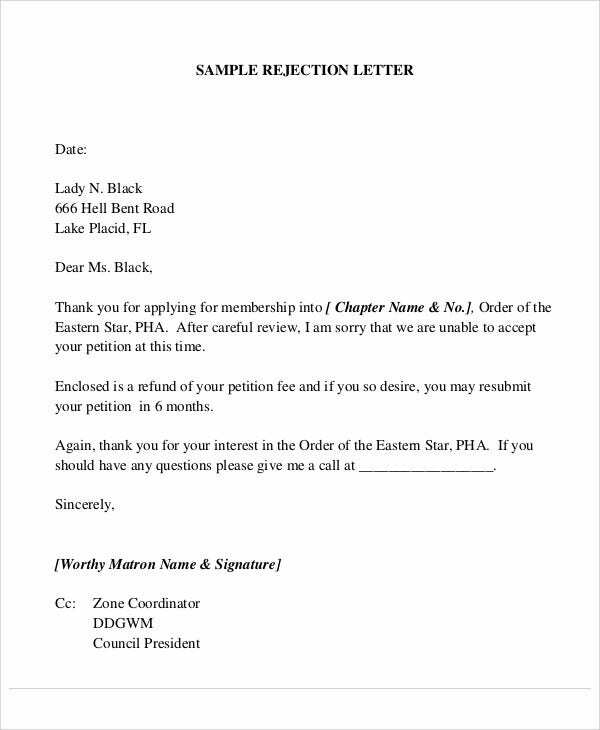 Membership Rejection Letter – Associations screen membership applications of aspiring members based on their policies and standards. 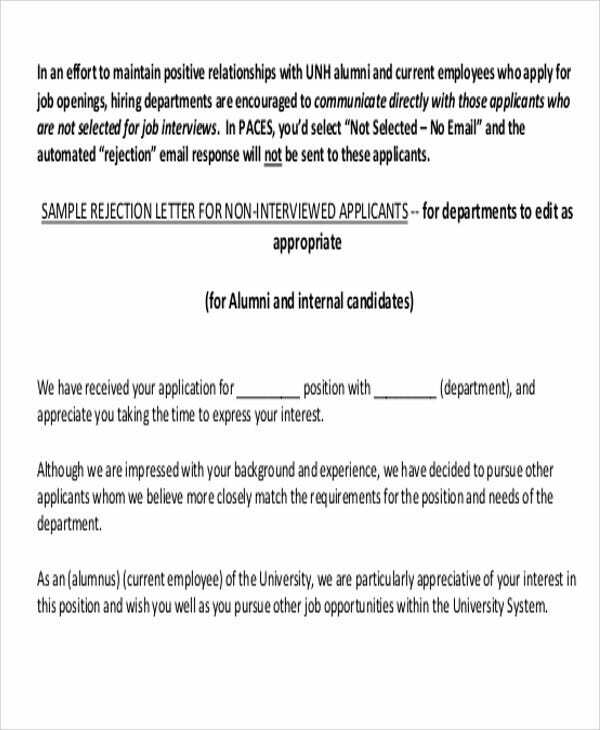 Declined applicants are presented with the information as shown on this type of rejection letter template. Start with a personal salutation. 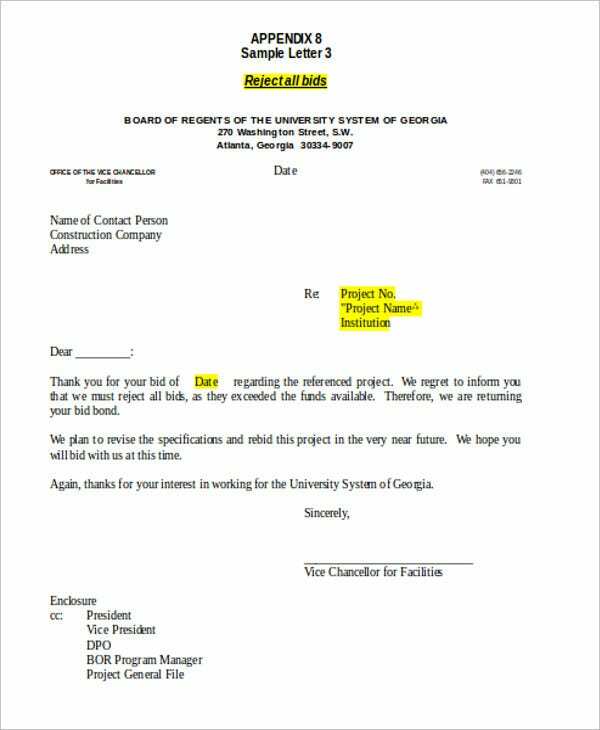 An email rejection letter may not need the salutation requirement because of the email features already stating the name of the applicant. 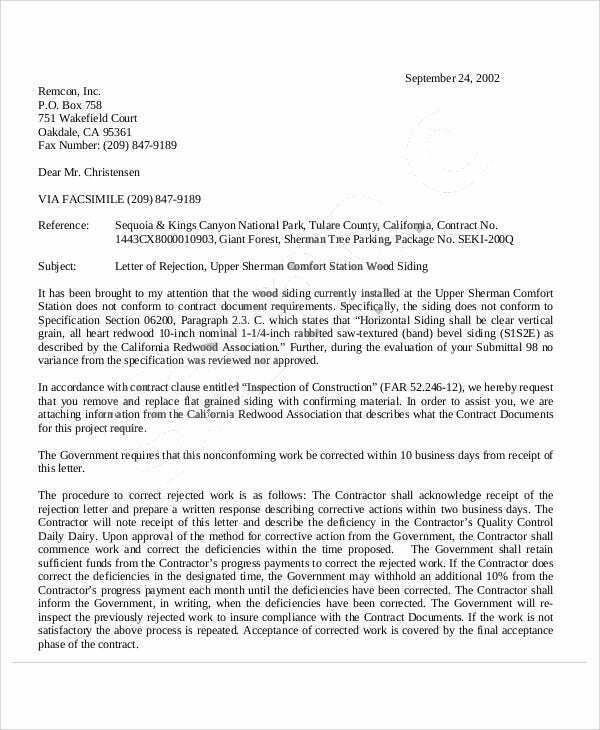 On the contrary, a formal rejection letter must address the applicant’s name to establish a connection with the applicant. Detail the reasons for the decline. 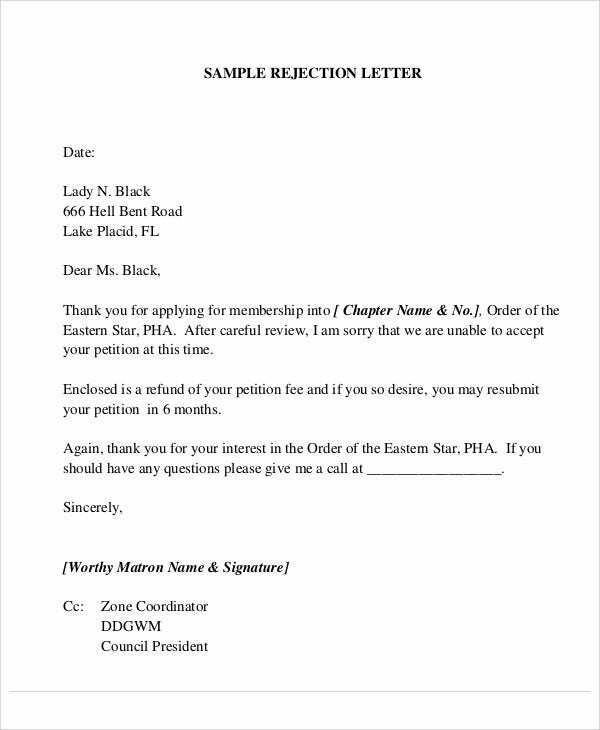 You must truly identify the reasons of the rejection on the letter in a cautious and positive manner. 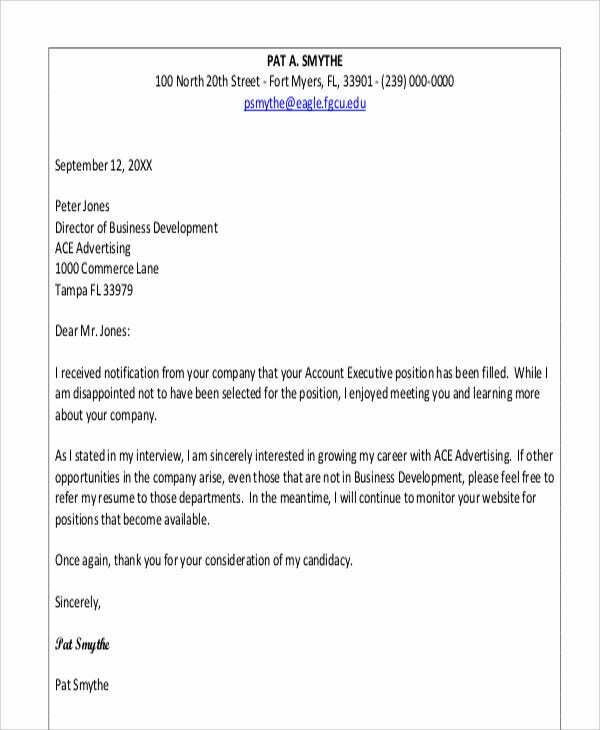 An employment rejection letter may include reasons such as the competition and the qualification the company is finding for the job. State a few factors in hiring the successful applicant. 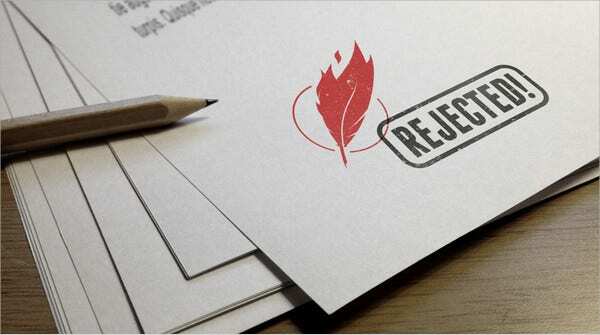 A business rejection letter may specify to the declined proposal of a company what factors they found advantageous on another company’s proposal. 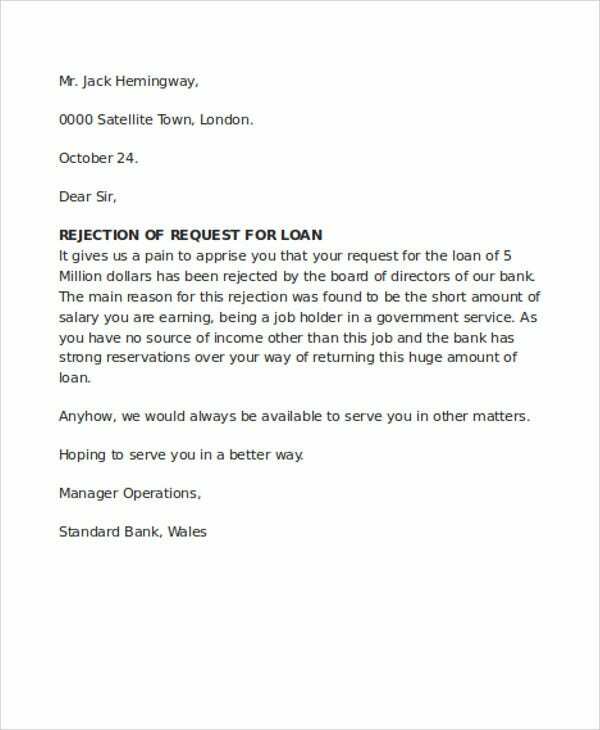 Close the letter professionally. 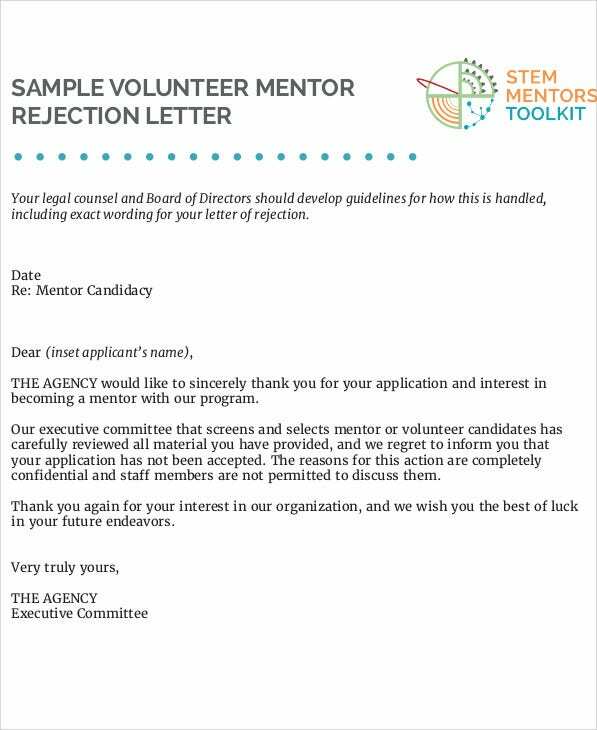 Rejection letters must be closed with an open consideration. 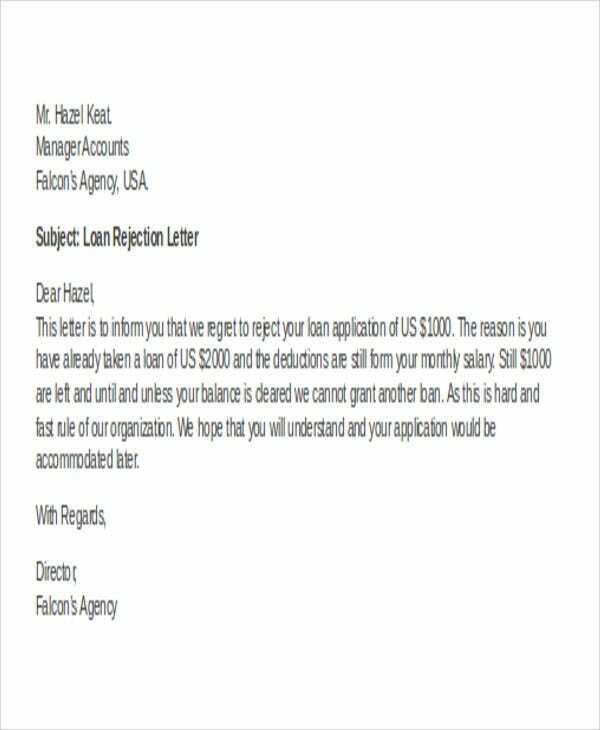 Take for example the loan rejection letter which encourages the loan applicant to try for other loan packages being offered by their business. Be sincere and warm in acknowledging the application. 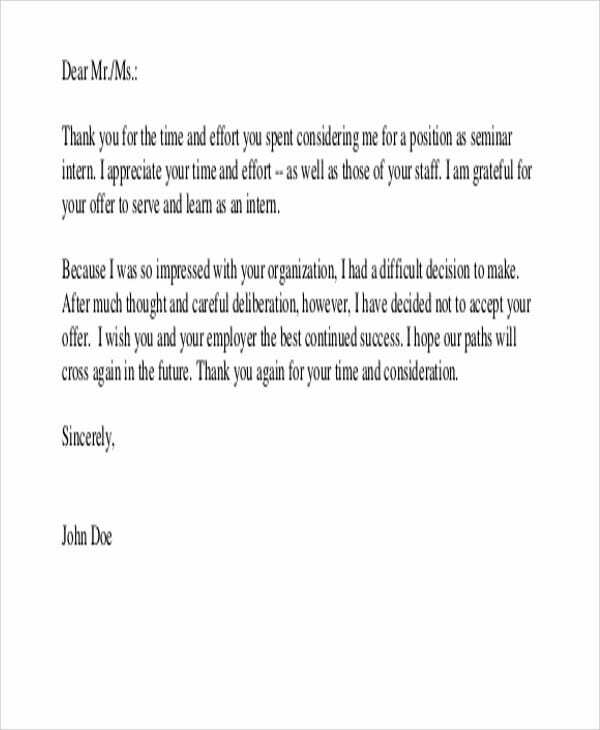 Warmly express your thanks to the individual or the business who sent the application. With this, you are acknowledging the efforts they have put into preparing the application. Be honest. Although you are advised not to go into detail as to the reasons of the rejection, you are to be truthful in terms of explaining the decline. A bid rejection letter is created with the facts provided by the company as their basis of the rejection. Proper relay on information of a rejection will help in lessening the dismay of the applicant. 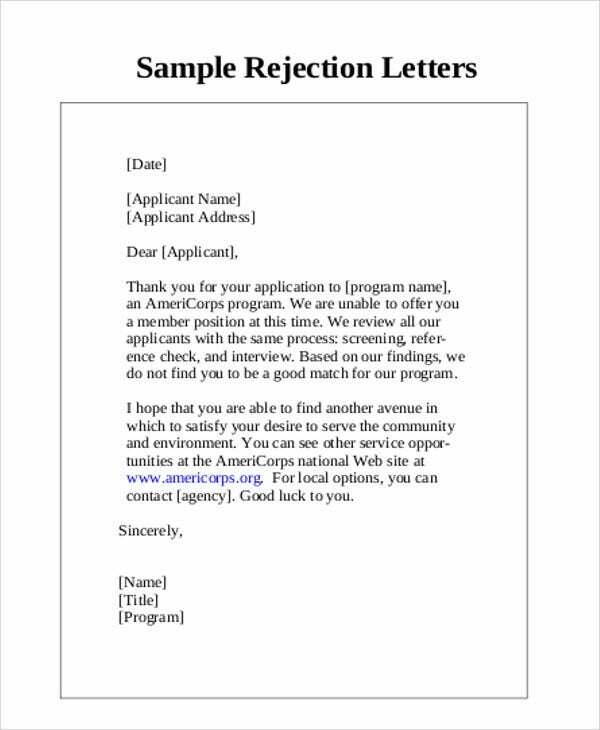 These rejection letter templates downloadable in PDF formats is your one stop to know the proper way of writing a rejection letter.